Signature : Mumei (unsigned) attributed as Shikkake Yamato school. 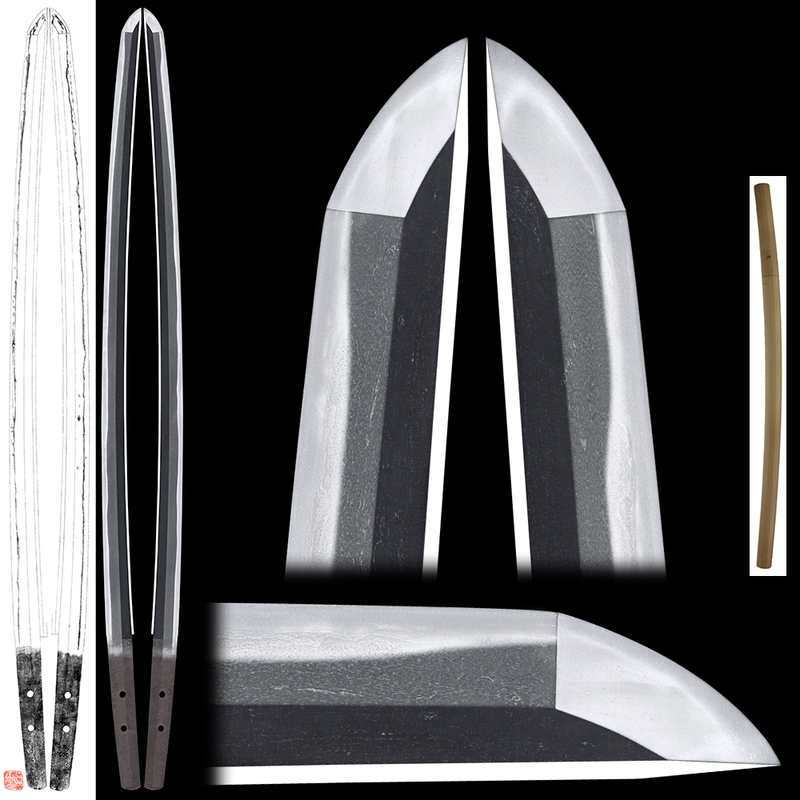 Blade length : 69.7cm or 27.4 inches. Width at the hamachi : 3.00 cm or 1.18 inches. Kasane : 0.68cm or 0.59 inches. Shapel : Oosuriage mumei (cut shortened) the blade is rather wide and thick with suitable curve and longer Kissaki. Jigane : Koitame hada well grained with Jinie attach and clear nice excellent Jigane. Shinogiji : Itame hada and Ooitame Hada with Masanagare. Hamon : Niedeki suguha with deep Nioikuchi double Hamon Uchinoke, and Ashi soft like morning mist quite elegant Hamon. Special feature : Shikkake School of Yamato province prospered present Tenri City in Nara prefecture. The name Shikkake is from Shikkake-ishi, the flat stone to place the divine palanquin in Shinto. The Jitetsu of this sword is extremely fine that has something in common with Taima School. It satietes the collector’s interest. Five principal swordsmith schools prospered in Yamato province　: Tegai, Shikkake, Taema, Senjuin and Hosho. Norinaga is thought as the substantial founder of Shikakke school. Dated Tanto in 1319, the third year of Bunpo era in late Kamakura period still survive at the age of 69. Counting backward, Norinaga was born in 1270, the seventh year of Bunei era in Kamakura period. Later generations Norinaga forged sword to the Muromachi period. Smart Shinogi-suji, wide Shinogi-haba, streamlike pattern of Itame-hada and Suguha-hamon are characteristics common to all Yamato province. The workmanship of Shikkake School shows traditional Yamato style. Ranged and conspicious Ko-gunome is an individuality of Shikkake. This blade’s Jigane is so nice. The mixture of Itame Hada and Mokume Hada with Chikei and Utsuri. The Hamon is typical Shikkake Suguha base with Gunome Midare. In Ha, there are many Sunagashi and Kinsuji. Boshi is Hakikake Kaen Fu. Saya : Black Ishimeji Saya. Tsuba : On the round shape iron Tsuba, a frag and screen are engraved. Fuchikashira : Dragon engraved on Shakudo nanakoji plate with gold color. Menuki : Bird is engraved with gold color.